Departing Loxwood player Ross Swaine. Picture by Steve Robards. Loxwood boss Alex Walsh paid tribute to 'an absolute legend at the club', as two players departed the Magpies in the space of 48 hours. Midfielders Ross Swaine and Lewis Westlake have both exited the Plaistow Road-outfit, with Swaine expressing a desire for more first-team football. 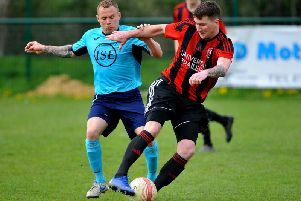 Swaine had been a mainstay at Loxwood for a number of years, while Westlake was a summer signing from Premier Division-rivals Hassocks at the start of the season. Walsh was sad to see the two depart from the Magpies and wished them well in future endeavours. But the Loxwood boss made it plainly clear that he wanted players that were willing to give their all in the Magpies fight against relegation. Walsh said: "I'm gutted. Swainey did say to me a couple of games ago that he was thinking about it, and we didn't want to lose him so we kept hold of him. "He's just a great character to have around the group. He's a good person to have in the camp and also he's a good footballer as well. "Unfortunately at the moment he hasn't had the game time that he needs. He's made that clear to me at his age that he needs to be playing football as opposed to not playing. "He wants to make sure he's enjoying his football and playing week-in week-out. He's had chances here and there but not as many as he'd probably want. "It's difficult because we're trying to find solutions to win every game. We're being competitive in games, and there's been a little bit of rotation, but we're trying to find the winning formula to get us away from relegation. "We want to thank Swainey for what he's done and he's been an absolute legend at the club. It's sad to see him leave. "Lewis Westlake has also decided to leave. Westy is another good lad. "We don't want to see players leave but at the end of the day we need players that want to be here and want to fight for points. "It's a shame to see him go and I wish him the best for what he decides to do afterwards."